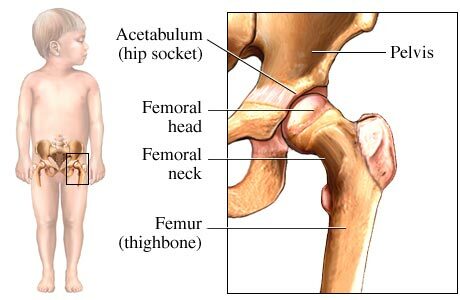 Developmental dysplasia of the hip (DDH) is a condition of a child’s hip which can affect one or both hip joints. For mild cases, the ligaments and soft tissues around the hip are not tight, the thighbone (femur) is able to move around more than a normal hip. For severe cases, the hip joint is so loose that the top of the thighbone (femoral head) will be shifted out of the hip socket. This is also known as subluxation. 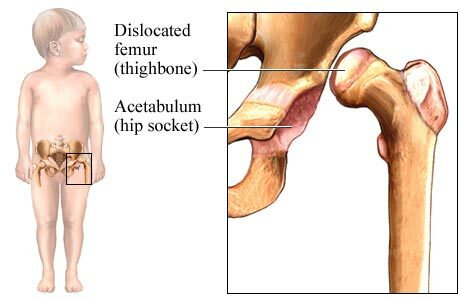 Dislocation of the hip, is the most severe form of dysplasia hip. The ball at the top of the thighbone fully slips out of the hip socket (dislocates). With subluxation or dislocation, the hip socket is too shallow that does not hold the hip at the supposed position and resulting the hip to slip out very often. The exact cause of dysplasia hip is unknown. A number of factors may contribute to your child’s chances of having dysplasia of the hip. They could be congenital or the baby’s position in the womb. Developmental dysplasia of the hip does not cause any pain. No obvious signs of a defect. Extra folds of the skin on the inside of the thigh. Less mobility or flexibility in the movement of the hip joint(s). Other physical deformities, especially of the feet. Stand with one hip raised higher than the other hip due to the thighbone that has slipped out of the normal position. Walk on toes with the heel off the ground. Stand with an unusual inward curve of the lower back if both hips are affected. Children with dysplasia of the hip without treatment may develop to lasting deformities in their hips. Untreated dysplasia hip can also lead to osteoarthritis of the hip. Dysplasia of the hip usually is diagnosed during your newborn’s physical examination. If the baby is older, dysplasia of the hip is diagnosed during developmental assessment. If the physical examination is uncertain, our orthopaedic specialist may refer for an imaging investigation such as ultrasound or X-ray for a better evaluation to your child’s hip joints. What to think about for developmental dysplasia hip? If your child has treated dysplasia of the hip successfully, he or she likely will not have any further future hip problems. However, it is good to examine your child’s hip to ensure that his or her hips grows and develop normally. The longer you left the dysplasia hip untreated, the more likely it will cause long term problems that will get more difficult to treat. It is important to diagnose and treat developmental dysplasia hip early. Follow up medical checkups are very important for monitoring the effectiveness of the treatment. If your child does not respond well to the treatment, damage may occur to the blood supply of the femoral head. If the condition goes undetected, the damage can lead to destruction of the bone cells (avascular ostenecrosis). The bone may grow abnormally, become deformed and develop to osteoarthritis of the hip joint. Call Now +65 64712674 to make an appointment to see our orthopaedic specialist to check your child’s hip today.